Here is a preview of my recent ocean blue corset and skirt I already had in a matching silk. A deeper ocean green-blue corset from the same pattern is in the works (fabric prepped today for cutting). I hope to share some images as the project progresses. Life has been busy. Another corset out the door, a chemise inprogress, & a skirt with medici belt. A ready made zouave jacket (not made by me) will be getting some upgraded trimmings and alterations on fit if time allows. Wedding stuff is sitting waiting for my attention. I’ll be at the Dickens Christmas Fair for all but one weekend this holiday season. Check it out. $3 off coupons will be easily picked up at your local Longs drugs store. Our guildmistress picked out some fabric she decided had to be used for the guild. 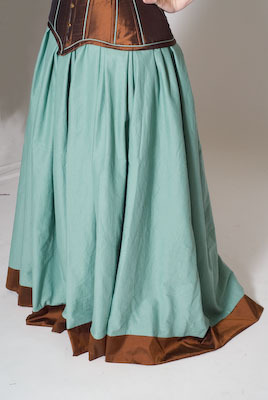 I dutifully purchased it and accepted the challenge to get a gown done by Folsom Renaissance faire. I wonder if I’ll get it done in time! I’ve been sick for the past week attempting to rest enough to get well. Still sick but making progress on work. Corset mock-up done, another corset drafting in progress. Just got the measurements for another shirt…. The project is majorly on the back burner but I wanted to show the progress. It was started because I needed a project I could pick up and put down whenever I wanted. I have very little of the two fabrics so it will be a welcome challenge to bring the project to completion with what I have available. A second black velvet row may be added to the skirt but I want to make sure I can pattern in all the accessories before dedicating the material to that purpose. I’ve finally gotten a photoshoot done of the red and gold pair of bodies. It is paired with a petticoat in matching silk damask. This is not a stab at a historical garment but a whimical journey into make-believe. Sometimes a girl just wants to look like a doll. I’ve made a matching bridle for my hobby horse Cocoa Nibs, most fondly nicknamed His nibs. He really likes to nibble on sweet nibs of candy. Here is a quick preview of a lovely new pair of bodies I’m making for a client. It is in a linen damask. The pattern matching was very finicky. I verified that they weave from side to side is not exactly identical and the portions that do match in design are up to an 1/4″ of an inch lower or higher in relation to other elements. In the end I think I found pretty close matches. This photo is done with harsh light accross the fabric so that you can see the pattern otherwise it is so subtle it doesn’t show in photographs. As promised we’ve added the modesty skirt to the gallery. See undergarments section for the new addition. These are not all of the final photos but I do not want to take more extensive ones until the matching pair of stays is fully complete. I’ve also promised a Proposed Projects section for the website and it is indeed still in the works. I’ve not forgotten about it. Much of the website work was delayed as I’ve been feeling under the weather for the past week. I’m on the path to recovery so expect more soon. Another new addition is on the way! The center photo on my main page is currently a link to a finished project that has been recently added to my gallery – sometimes randomly changed for variation. This will soon have an added feature. I’ve been posting a bunch of dress diaries to livejournal but want to migrate that feature over to my actual webpage. Featured projects will include a larger photo and more in-progress construction details, allowing you to see the design process and actual constuction quality that sets my work apart. I really love this color combo.